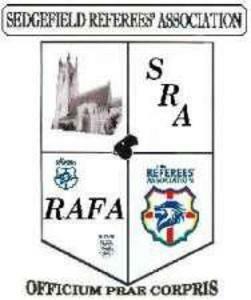 Sedgefield RA is one of the best County RA's in the North East, with a wealth of experience from our members at all levels of football. Support and Advice - our experienced members are always at the end of the phone or computer to offer you help and guidance. With opportunities to be mentored by one of our senior colleagues throughout your refereeing career. Insurance - this includes during the match and traveling to and from games, equipment theft as well as accident/injury cover. Benevolent Fund - access to funds, should a member fall upon hard times. Physiotherapy - access to treatment during times of injury (optional). We endeavor to get a top class guest speaker at every meeting. Recent speakers have included: Brian Parry (ex-Football League Assistant Referee and Observer), Gary Beswick (Select Group Assistant Referee), Barry Sygmuta (ex Select Group Assistant Referee), David Webb (Football League Referee), Geoff Eltringham (Football League Referee), Jeff Russell (Durham FA RDO) and Alan Wilkie (ex-Premier League Referee and Observer).